At the turn of the century, as we know, world leaders came together at the United Nations and agreed on a bold vision for the future through the Millennium Declaration. The Millennium Development Goals (MDGs) were a pledge to uphold the principles of human dignity, equality and equity, and free the world from extreme poverty. The MDGs, with eight goals and a set of measurable timebound targets, established a blueprint for tackling the most pressing development challenges of our time. The main goals is we can end poverty in 2015. MDGs have made a profound difference in people’s lives. Global poverty has been halved five years ahead of the 2015 timeframe. There has been important progress across all goals, with some targets already having been met well ahead of the 2015 deadline. All stakeholders will have to intensify and focus their efforts on the areas where advancement has been too slow and has not reached all. Substantial progress has been made in most areas, but much more effort is needed to reach the set targets. Major trends that threaten environmental sustainability continue, but examples of successful global action exist. Global emissions of carbon dioxide (CO2) continued their upward trend and those in 2011 were almost 50 per cent above their 1990 level. Millions of hectares of forest are lost every year, many species are being driven closer to extinction and renewable water resources are becoming scarcer. At the same time, international action is on the verge of eliminating ozone-depleting substances and the proportion of terrestrial and coastal marine areas under protection has been increasing. Hunger continues to decline, but immediate additional efforts are needed to reach the MDG target. The proportion of undernourished people in developing regions has decreased from 24 per cent in 1990–1992 to 14 per cent in 2011–2013. However, progress has slowed down in the past decade. Meeting the target of halving the percentage of people suffering from hunger by 2015 will require immediate additional effort, especially in countries which have made little headway. Member States are now fully engaged in discussions to define Sustainable Development Goals (SDGs), which will serve as the core of a universal post-2015 development agenda. Our efforts to achieve the MDGs are a critical building block towards establishing a stable foundation for our development efforts beyond 2015. The struggles and upheavals around the world have highlighted the lack of sufficient knowledge and a Global Services Support for local people, local governments as well as those who actively work toward sustainable and integrated development. Access to data, information, funding, and tools for development are not enough to guarantee success of the Sustainable Development Goals (SDGs). A suitable social mechanism is necessary to connect a global audience to necessary resources while providing a system to translate these goals, data, information and knowledge into sustainable local best practices. Sustainable development of our global society is possible, but will require more than work. Sustainable agriculture was highlighted at the United Nations Conference on Sustainable Development (UNCSD) in Rio de Janeiro, Brazil in June 2012 and the annihilation of global poverty is a sustainability principle formally endorsed in “The Future We Want” Resolution 66/288. Sustainable agriculture is one of plan for creating sustainable agriculture as an integral part of global sustainability good for business. Sustainable agriculture is the act of farming using principles of ecology, the study of relationships between organisms and their environment. It has been defined as “an integrated system of plant and animal production practices having a site-specific application that will last over the long term.”Sustainable agriculture ultimately it seeks to sustain farmers, resources, and communities by promoting farming practices and methods that are profitable, environmentally sound, and good for communities. Sustainable agriculture fits into and complements modern agriculture and it rewards the true values of producers and their products. Sustainable agriculture works on farms and ranches large and small, harnessing new technologies and renewing the best practices of the past. Sustainable Agriculture is a) economically viable, if it is not profitable, it is not sustainable, b) socially supportive, the quality of life of farmers, farm families and farm communities is important, c) ecologically sound, we must preserve the resource base that sustains us all. Sustainable agriculture as a system that can indefinitely sustain itself without degrading the land, the environment or the people. It reflects our concern with the long-term viability of agriculture. The challenges of sustainable agriculture Research and innovation to increase food security and crop productivity is one of the major challenges worldwide in the years ahead, with global food demand forecast to rise by 70% by 2050, accompanied by the increasing demand for feed, fibre, biomass, and biomaterial. However, this challenge is accompanied by a slowdown in productivity growth and increased pressure on the environment and our natural resources. The concept of sustainable agriculture embraces a wide range of techniques, from organic to low-input, from holistic to biodynamic. The common thread among these methods is an embrace of farming practices that mimic natural ecological processes.The key challenge for agriculture is not only to produce in a sustainable manner, but also to produce more. These challenges will not be resolved without a major push towards embracing research and innovation. The challenge is to bring researchers, farmers and other players closer together so that we can accelerate the speed of technological transfer from science to farming practice, and provide more systematic feedback about practice needs from farming to science. The term Green Growth signifies an alternative development path that simultaneously pursues socio-economic progress and environmental conservation. Green Growth is a 'hot topic' and now a paper is linking it to climate change and agriculture. As a national development model that simultaneously pursues socio-economic progress and environmental conservation, the Green Growth concept has been tested in countries around the world through context-specific policies and projects. Green Growth strategies. As national strategies evolve into on-the-ground practice, robust investment in climate-smart agriculture will be essential to achieving real sustainability. 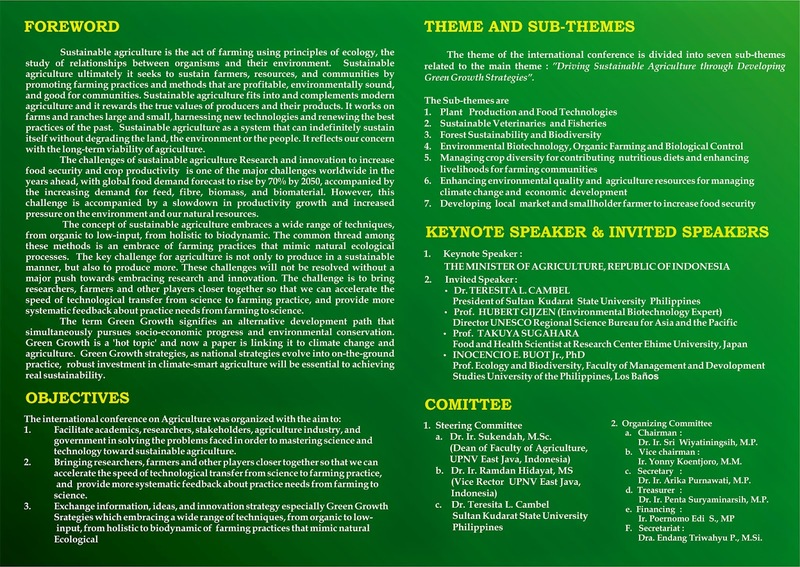 The theme of the international conference is divided into seven sub-themes related to the main theme : ”Driving Sustainable Agriculture through Developing Green Growth Strategies”. Director UNESCO Regional Office in Jakarta. Dr. INOCENCIO E. BUOT Jr.
7. Non Government Organizations (NGOs) in the field of Agriculture. The international conference will be held on August 6-7th, 2015 and will be conducted in Technopark in the Campus of University of Pembangunan Nasional "Veteran" (UPN) East Java, Surabaya Indonesia. 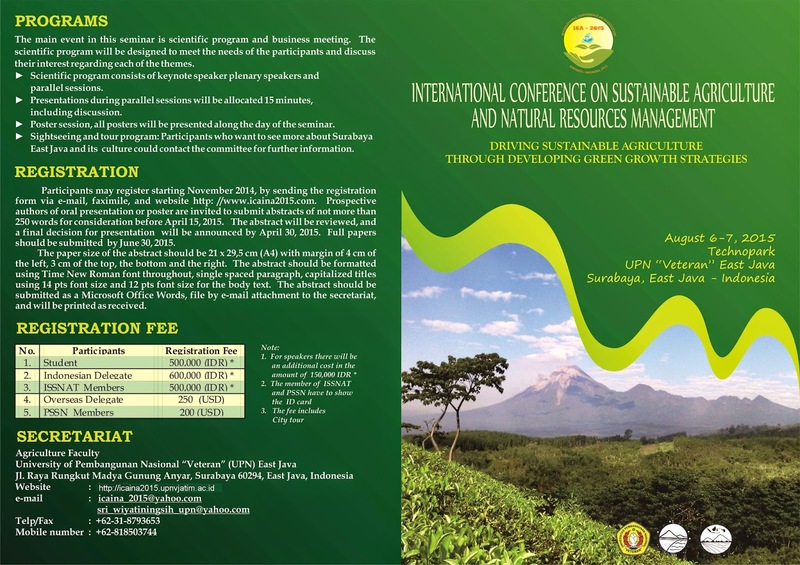 Participants may register starting November 2014, by sending the registration form via e-mail, faximile, and website http: //www.icaina2015.com. Prospective authors of oral presentation or poster are invited to submit abstracts of not more than 250 words for consideration before April 15, 2015. The abstract will be reviewed, and a final decision for presentation will be announced by April 30, 2015. Full papers should be submitted by June 30, 2015. The paper size of the abstract should be 21 x 29,5 cm (A4) with margin of 4 cm of the left, 3 cm of the top, the bottom and the right. 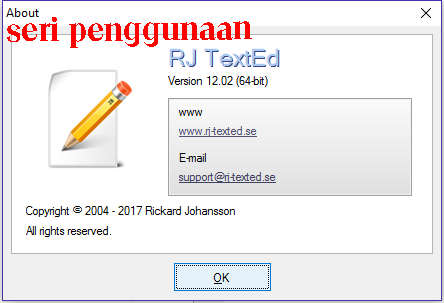 The abstract should be formatted using Time New Roman font throughout, single spaced paragraph, capitalized titles using 14 pts font size and 12 pts font size for the body text. The abstract should be submitted as a Microsoft Office Words, file by e-mail attachment to the secretariat, and will be printed as received.